Olea Europaea is a tender evergreen that thrives in warm subtropical areas, growing to 10metres in height. It has opposite leathery, shiny, narrow dark-green leaves up to 6cm long. Small white flowers in the summer are followed by green olives which given a long enough period of warmth ripen to black. O. Europaea has light-grey bark which becomes particularly gnarled with age. This is a broad-leaved species that lends itself well to areas of deadwood. Position Full sun. 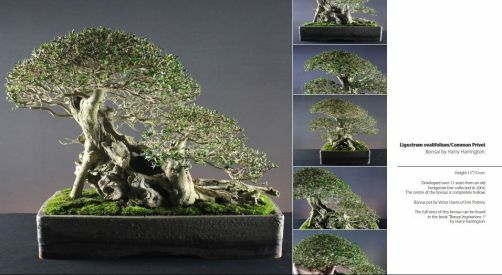 Though able to withstand temperatures to 0°C in its natural habitat, as a bonsai it should not be exposed to temperatures below 7°C. In frost-prone zones Olives are grown indoors, however to retain the health and vigour of the tree, placement outdoors from May until September is recommended. Feeding Fortnightly from Spring to Autumn, do not feed during the Winter. Repotting Every second year in Spring. Use a free draining mix. Propagation Sow seed at 13-15°C in Spring, semi-ripe cuttings in summer. Pests and diseases None other than scale insects. Styles Suitable for all styles except broom and for all sizes.